War is hell... This was worse. 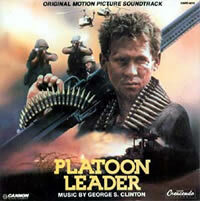 GNP Cresendo presents the original soundtrack to the 1988 war drama PLATOON LEADER starring Michael Dudikoff, Robert F. Lyons and William Smith featuring music by George S. Clinton (AUSTIN POWERS). A young officer, just out of West Point is sent to Vietnam, where the men don't respect him until he gets wounded and returns to be a wiser soldier and a better commander. This was George S. Clinton's first-ever soundtrack release.